There's three weeks to Election Day and trend lines are emerging in the winner takes all council majority sweepstakes. Six of the nine Hoboken City Council seats are up for election and five of the council ward seats are heavily contested. The appearance last week by statewide powerhouse for NJ governor in the form of Jersey City Mayor Steve Fulop at the fundraiser of Mayor Dawn Zimmer for her council slate gave the OGs the willies. 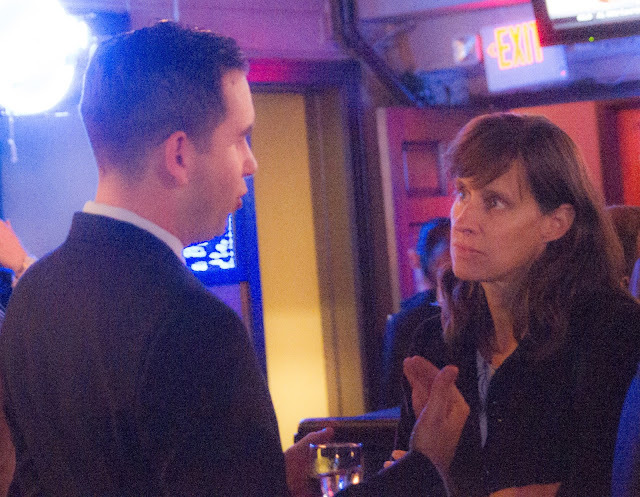 Mayor Steve Fulop of Jersey City with Mayor Dawn Zimmer in Hoboken set OG's tongues wagging. Their laments and tales of woes are increasing along with in-fighting about the mayor's ability to turn out the vote in key wards especially the heart of Hoboken for Jen Giattino and Peter Cunningham in the 6th and 5th. Who turns out their votes on Election Day points to the victor and who will hold the reins with a critical City Council majority. Cries of panic, lack of manpower, volunteers and fears that HudCo is not with them (and won't be) saving the day emerged after that event at Arthur's reportedly added a significant haul to the citywide efforts to engage and turn out the vote. Anthony "Stick" Romano is all in and as a county freeholder knows the cavalry isn't coming. 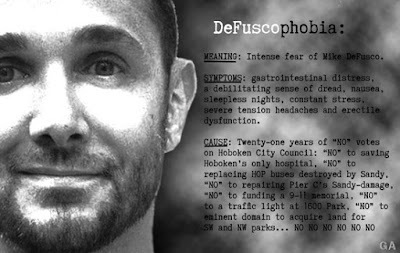 HudCo thinks the Russo faction ticket in Hoboken is much too toxic to go near let alone support. They'll cash the big, fat Mile Square taxpayers' checks and call it a day. Also recall, it was in November 2012 directly after Hurricane Sandy the power barely came back on in time for the election but when it did, massive numbers backed moving to November elections. This despite every argument the OG could muster against such a proposition where paid voters re: "campaign workers" becomes an ever more expensive proposition to beat the teaming masses of regular voters and win elections. Ironically, this election does not feature the presidential sweepstakes atop and that's the last OG hope remaining. Low turnout is their friend as is subsidized housing residents where their reliable vote does as told. See Applied Housing as the biggest example uptown of that quotient but the question remains between that and a more rebellious minded resident smelling a sea change in the stranglehold of old time corruption, is it enough? There's no money bags to be found within the Old Guard's midst although Carmelo Garcia is importing much loot from his Democratic Assembly campaign he knew would never happen. The midtown sixth ward race between Garcia and Councilwoman Jen Giattino is the flash point citywide. It's the epicenter of how many people will see and hear The Wire's lying eyes versus the disciplined low key ballet dancer with the actual track record of success much like Reform in the last several years. The last City Council meeting (MSV did not attend) showed signs of getting squirrely and not a little desperation. In public portion, hired hands, shrill voices and whining about the trend line of Hoboken's park efforts and its improvements were called a stab in the back and made for a muddled mix. Is progress for all truly bad and can big development special interests turn this election? Much of those differences centers on big development having its way in the Mile Square. (And you think rush hour traffic is bad now?) The Old Guard council members are as their history proves not willing but eager to sell Hoboken out to the highest bidder and cash in behind closed doors making out of town friends and earning favors for their friends and family. HBO be damned, the Hoboken Sopranos are on the air! At the Hudson Reporter debate, Peter "Monarch Man" Biancamano finished his boilerplate scripted lines saying he promised not to break any he's committed. He of course failed to mention he's not committed or promised to fight the Monarch Project, a major NJ developer which did exactly that in a contract with the City of Hoboken. 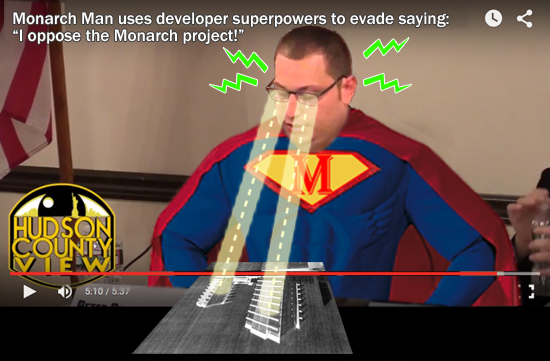 Monarch Man can only find words to blame Hoboken in that costly legal wrangle. Pete Biancamano all but admits he's Beth Mason's Develop or Die third term. When it comes to big developer broken contracts, he neither sees nor hears any problem worth opposing: even with his Monarch Man super vision. Peter "Monarch Man" Biancamano promises to keep his word but he's said nary a single word against the Barry family and their "strong armed" voter tactics in their Applied buildings or their broken promise and contract with the City of Hoboken for tennis courts and open space in the northeast corner. So there you have it, he's keeping his word with the Barry's and big developers and wants Applied votes. Any questions? Biancamano is compromised by his dire need to have Applied Housing and the Barry family turn out the vote by hook or by Raul. Short of that, he isn't seeing liftoff against Tiffanie Fisher who is finding her stride with a true to life grassroots campaign of Reformers who want to put the nightmare of Beth Mason behind them once and for all. The other Mason family beneficiaries are said to be Eduardo Gonzalez in the fifth ward in his race against incumbent Peter Cunningham and Mister Carmelo in his bid against Councilwoman Jen Giattino. It's not an election without that ole Mason vindictiveness. It's oozing out sooner than later. Bonnie Murray is playing her Tiffanie-light role perfectly as both a lightweight candidate who doesn't take on the x-ray vision of Monarch Man or serious campaign activities. Yesterday, Grafix Avenger said a vote for the wife of "Bathtub Brian" is a vote for Peter Biancamano. She's not wrong and one long time activist is fuming at Murray's attempt to take credit for the work of others in the second ward. In the fifth ward, Councilman Peter Cunningham is building on his effective governance rallying friends old and new to marshal up the grassroots for another effective thrust. His opponent Eduardo Gonzalez wants to focus on a free developer deal, trading acres scheduled for parks and a first ever northwest municipal garage he launched right out of confidential negotiations in a closed session City Council meeting. Gee, who let that cat out of the bag before it's due date again Mikie? What Gonzalez would like to talk about is the new digs of the Elysian School and what a nice guy he is with those parents. What he doesn't want to talk about is the years he spent voting for every foul action by Carmelo Garcia on the Hoboken Housing Authority board. The acrid financial doings occurred on his watch and backing. Or have we also forgotten the huge redevelopment scam in 20/20? Besides, look at the other political friends he's keeping. Do you think that will be kept under wraps until Election Day? Please stay clear of the coming Horsey stampede. No one rides for free on the Mikie Russo ticket bandwagon. Speaking of stampedes, there's a two footed hoofer in the first ward scaring the wilikers out of poor Councilwoman Theresa Castellano. She's not literally poor but there's poor in health as in when she callously said there's other bidders in the last minute effort to see St. Mary's shuttered and there's poor in spirit. Sometimes you give up the ghost politically speaking when the grim reaper of accountability awaits you at the election polls. Some say she's suffering badly from a case of Fuscophobia? Mike Defusco is hoofing it in the first ward with the single-minded focus of the Terminator. The worst is not evident as he's holding not a single secret weapon but two. It's been cleared up? The Terry Castellano nemesis in the first ward is on the move. On Election Day, a secret weapon or two may see things, "cleared up." Talking Ed Note: Some mushy pushback on the MSV exclusive uncovering the Weehawken steak house dinner where Russo and Raia came to a deal courtesy of Mayor Roque's largess on an NHSA commissioner seat. It's Russo walking away the winner running unopposed for a council seat. No one denied the dinner, neither Raia or Russo returned phone calls when the deal was uncovered here and got a MSV proctology scope. Attempts at reviving the deal failed more than once in the Mile Square soon after. Someone tell Pupie how to work the Obamacare website. Hey, let's move on and not talk about corruption. Is that okay with you Mikie? Monarch Man x-ray vision and Defuscophobia graphics courtesy of Grafix Avenger.